For our date night dinner tonight we did some simple Habanero Glazed Pork Strips. I let these guys go in the smoke for about 45 minutes then pulled them off, turned up the heat to finish our Smoked Chipotle Garlic Treat (http://datenightdoins.com/smoked-chipotle-garlic-treat/) and twice baked potatoes. Returning the pork strips to finish to a Smoky Heavenly Habanero Delight! Rub the pork with a nice coating of Pete’s Firehouse and set them aside to come to room temperature. Meats cook more evenly if they go on the grill at room temp. Let them sit in the smoke @ 170 degrees (77c) for 45 minutes. Then, pull them off, turn the heat up and finish your sides. Add the meat back to the grill and brush a coat of the Habanero Glaze on. I did a few coats of the glaze and turned them a few times to caramelize the glaze. For the glaze I put a few tablespoons of Habanero jelly in a small bowl then into the microwave to melt it so I could brush it on. I like to smoke everything for at least 30 minutes with an hour being even better. After all the Green Mountain Wood Pellet Grill is an awesome smoker so use it for all the wood smoke flavor it will add to your food. So after the grill comes up to temp and burns clean turn it back down to 170 degrees (77c) for 45 minutes. Place everything directly onto the grill and just let it hang out in the smoke and get happy for 30 minutes or so. This is referred to as “Smoking” or “Hot Smoking”, the temperature is 170 degrees (77c) 30 minutes of smoking is not enough to have any cooking effect on your meat but it is enough to open the pores so that the meat can pick up all the flavor of the smoke. After 30 minutes, turn the (Temperature Control) up to 400 degrees (205c) and pull the meat off the grill. 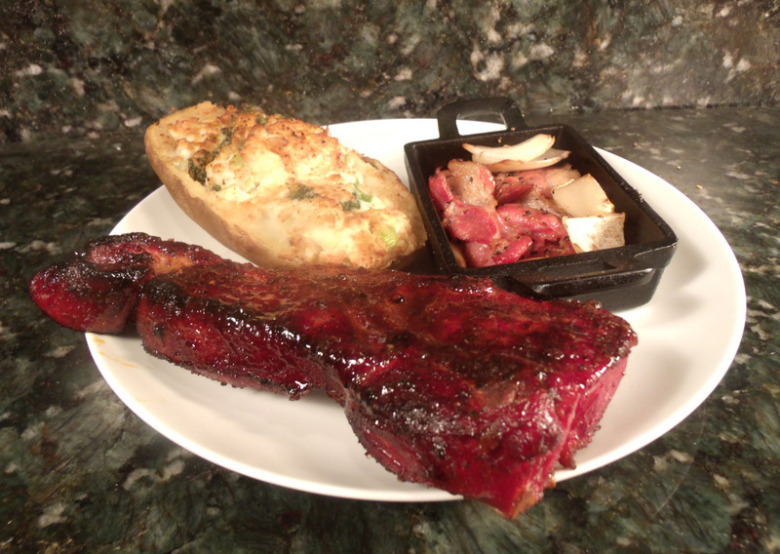 Now you can cook your sides and pick up all the wood fired flavor from the grill. I did 30 minutes here at 400 degrees (205c). Then pulled my sides and put your meat back onto the grill I did the meat for 10 minutes per side. Do a nice brush with the Habanero Glaze. Perfect. When the meat reaches an internal temp around 130 – 140 (55c) pull it off, cover it and let it rest for 10 minutes before serving. This will be medium rare. Keep in mind that the meat will continue cooking for another 10 degrees after you pull it off the grill. USDA recommend temperature for pork is 145 degrees (64c). I use a Maverick ProTemp Instant Read Thermometer for checking meat temps. Oh my! That habanero jam would be so good on my saniwdch! Thank you for sharing and inspiring me. I just found your blog today. What a sweet treat! I hope you have a great day!